There are 2 ways to enter the system. By internet or by a radio transceiver. To enter by internet, follow the instructions below. To enter by radio read this. 1. Read the rules for using the system. 3. Start the program when you are connected to the internet. 4. Fill in the parameters as this picture shows. First set the Server parameter, and port number. Then set the call sign. Type in your name or nickname. You don't need to set the password. Set CALL in the Room parameter. When you have done this press the connect button. Press spacebar or the PTT button to talk. Release it to listen. You can se written chat messages in the big window, and send one by typing it to the comment field right to the call sign and press send button to send it. You can select another room by clicking on the arrow button right to the room. You can create a temporary room by just typing something in the room field. This room will disappear automatically when emtpty. For Windows XP and higher. When entering the system by radio you will come into the CALL chat room on the internet system. On the Radio you can hear all talking on that chat room and you can talk into this chat room from the radio. There are several types of radio links. 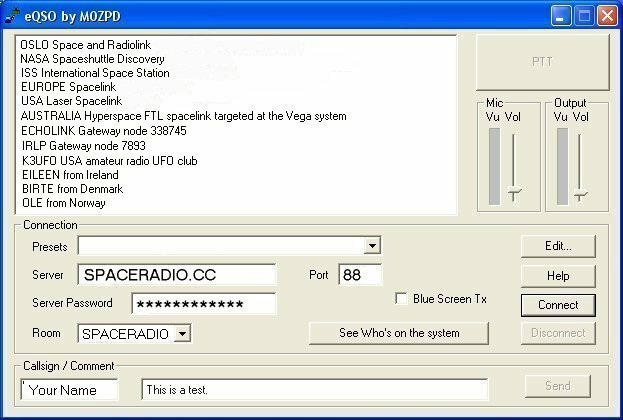 One appear as radio link with the name of the city or geographical area the radio link is covering as its call sign, A second type appear as space link with the name of the part of the world the link are placed as its call sign. This type of links are directed toward the outer space. A hyperspace FTL link sends the signal into the hyperspace enabling communication directly to other planets in distant solar systems by sending the signal faster than the speed of light. A echolink gateway are a gatway to the echolink amateur radio system. Through this link it's possible to contact NASA spacecrafts. The radio link system only links voice not text messages. You will not see any call sign from persons using the radio link system on the message screen where the radio links are placed. The radio link becomes blue on the message screen when someone use a radio link to talk into the chat room. To get the frequency information about radiolinks and spacelinks you can go to this page. The frequency information is also avaiable when you have logged in to the system. This picture is only an example on a setting with radio links on the CALL chat room. The radio links on this picture does not exist. 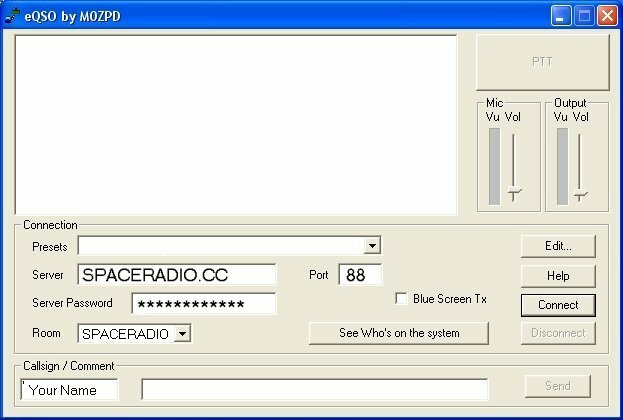 Click here for instructions how to create a radio link and connect it to the system. Click here to get the frequencies of the radiolinks. The system are under construction, and all radiolink types described are not available yet.